Now that you’ve made jars upon jars of tasty jam, you may want to dress some up to give away to friends and family as gifts, and you’ll definitely want to label them so you’ll know whether you’re opening a jar of strawberry jam or raspberry jam. 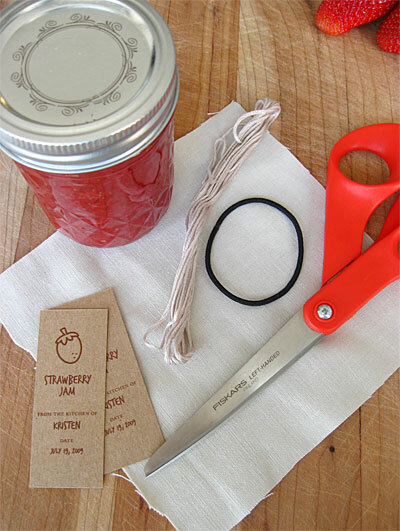 Below is a quick how to for making fabric jam jar toppers, and I also have printable rectangular tags and circular labels for 9 different types of jam. The circle labels are 2 inches in diameter and were made to fit half pint jars, but they’ll work on any jar lid 2 inches or larger, and they can also be used as labels for the sides of the jam jars. I printed my tags onto kraft cardstock for a rustic look, but you can print them onto white cardstock for a similar look, or you can break out the colored pencils and crayons and color them in however you’d like. This would be a great activity for the kids to do while you’re making the jam. Fold your fabric square into half, and then fold it into half again. Cut along the open edge in an arched shape, creating the outline of a quarter circle (above top). This doesn’t need to be exact, as you can trim the fabric later. Roughly center the fabric over the top of the jar, and place a rubber band (or a new hair elastic if you don’t have a rubber band) over the fabric until it is snugly in place over the jar lid (bottom left). You may have to wrap the rubber band around the lid more than once in order to fit the fabric snugly. 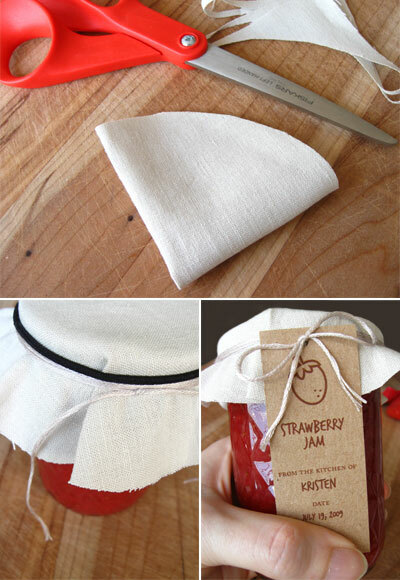 If needed, adjust the fabric in order to get even distribution around the jar lid. Wrap embroidery thread or thin ribbon around the jar lid a few times, pulling firmly to make sure that the thread or ribbon will hold the fabric in place. Tie the thread or ribbon into a knot (bottom left). Remove the rubber band or hair elastic. Note: If you’re going to be shipping your jam or transporting it in such a way that it will be jostled around, you should use a rubber band to fit the fabric to the lid and just leave the rubber band in place to be covered by the thread or ribbon. Otherwise, there’s a chance that the fabric topper will pop off in transit. 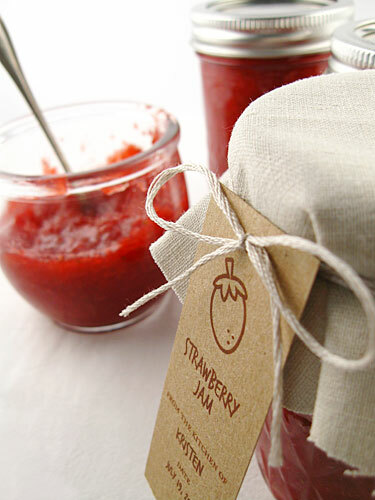 Using a small circular hole punch, punch holes at the top of your jam labels. Thread the ribbon or thread through the hole and tie a knot or bow to finish. Trim the ends of the thread or ribbon, and trim the fabric if needed. Ta-da, you’ve got a prettied up jam jar! Aww, thanks, E! They were a lot of fun to make. Argh! These are so, so, SO cute! I love them! Thanks so much for sharing, I’ll be linking to this. These labels are adorable. Thanks for sharing! Fun! Cooking + Crafts. Was there ever a better combo? Oh I LOVE this! Thank you so much. I am about to can 265lbs of peaches this week and I am ready to explode with ideas on how to use them all. Wonderful post. so sweet! pun intended. Thanks I have made cherry jam before it was much easier than I thought it would be and soooooo good! thanks for the jam ideas! can’t wait to try it out! Thanks, everyone! So glad that you’re enjoying the recipe and labels. Rachel – Thanks so much for the link! Meghan – cooking and crafts do make a perfect pair! Rachel – I’ll have a blackberry one up by sometime this weekend. How could I forget blackberry?! Just stumbled in – I love, love, love this blog. Should have landed here this Spring – would have had so many things to do with my son. I have a quick question and I’ll take my answer off the air – when you’re designing tags, etc. are you using Illustrator and some kind of Wacom tablet? I have Ill CS only (can’t afford to upgrade) and just ordered a tablet cuz my arm’s gonna fall off if I try to trace any more sketches with my mouse. No trace option in my Ill version. That’s all – just wanted some inside scoop if poss. Posted about the site on my Twitter yesterday (@foundtoday) and will post on my blog as soon as possible. Thanks!! Thanks, Chrissy! Just emailed you re: Illustrator. Glad to hear it, Rachel! Bellissime ho fatto un post nel mio blog. These are fantastic!!! In England, we call Orange Jam ‘Orange Marmalade’. Any chance of a Marmalade label? It’s SUCH a great word, isn’t it? Anna – There’s an Orange Marmalade label in the lineup (next to last in the link list above), so download away! And marmalade is a great word! To add a different “twist” to these adorable labels and jar tags…print them off on ‘plain WHITE label/cardboard stock paper’ using a orange marker or other matching colour to that of the jar contents! A fun play on colour matching! I need to find a way to incorporate my name in type to that of the tag…any suggestions? These are beautiful! A very cheeky request – I don’t suppose there’s any chance of a ‘damson jam’ one, is there? We’ve had a glut of damsons this year so I have lots of jam to give to people, but there’s no way I could design a label as lovely as these myself! Brooke – I used a font called TrashHand (http://www.dafont.com/trash-hand.font) for the jam names. It’s free to download, and if you have a graphics program like Paint Shop Pro or Photoshop you should be able to open the PDF there and make a new layer where you can customize the labels with your name. Minnie – Since a damson is basically a plum (right?) I can use the plum illustration and create a damson label. Just give me a few days to post the files! Becie – I don’t have any labels for chutneys or pickles, as I haven’t tried to make anything like this, but in the future if I give it a try I may post some labels. Thank you for the labels! My gift-giving just became easier! These are too cute! strawberry jam is my favorite…thanks for the free download! Thanks for creating these tags and toppers. They are so adorable! Lovely labels, thanks for sharing. I’ve added a link from my blog. We just featured your Adorable labels in our latest blog entry… We hope you enjoy it!! What a wonderfull blog!! !…I love homemade jams and I use to give them to my friends as a present. What a nice lavels!!!. Thank you!! Thanks for this project! It’s lovely. Best wishes from Spain. I just found your lovely corner in the blogland. So happy I did! I absolutely love this project! Have a happy week! Hi. These are great, and can’t wait to give out jars and jars of jam at xmas.thank you. I was wondering where you got those jars from though, I can’t seem to find anything but plain ones around. I really like the details in the one uyou have in the picture. Hi, just wanted to say I’ve just stumbled across ur blog while looking for labels. These are fantastic and just what I’m looking for, hope you don’t mind if I “steal” them?? BUT….LOL….. any chance you can do a Lemon Curd one as I’ve found a new passion for making that recently! I applaud you for such amazing crafts. Thank you for sharing. I thought this year for Christmas I’m going to give home made gift as dollars are very tight and I search everywhere to find labels. Thank God I found you. My jams and jellies will look so professional. Question though, how do I get my own name on the lable as it is a PDF?? Please advise. Thank you kindly. Hi…how about a grape jelly label!? I think your design is adorable! Got the blackberry one…thanks! Thanks so much for the free download! I was wondering what font you used to fill in your labels. Just want it all to match! Thanks again! Thank you sooo much for all your downloads. You are very talented and have such an amazing website. It’s incredibly generous of you. I am saving them for the summer. Thanks! Thank you so much for sharing these!! They will make the homemade jam gift for my grandma that much more special! What else to give a lady turning 93?! These are so adorable. I’m probably getting greedy here, but is there anyway you could do an apple butter one? I know it’s not really a jam, but I’ve made 100+ jars and I have been looking for a fun way to dress them up. Thanks! These are labels are so cute! Thank you so much! These are great! Please add one for Mango Jam. Thank you a lot! Great idea! :)!!!! Hi, Love the tags, I wondered if you had one for Blackcurrant jam as I have lots of these. Thanks. Elise. I love these labels!!! They are the perfect finishing touch to my Jams! I was wondering if you had a lable for Apricot Jam I just made a ton of it and I have no lable. Thanks! These are so cute! How do you download them so that you can add your name and date to them? These are fabulous. Any chance of one for Gooseberry Jam? Where did you find the cute graphics! I am trying to make my own for Hot Pepper Jelly. Thank you so much! Printed these off and used them for the jam I made for gifts. Just perfect! I love these graphics too! So simple that it’s elegant and cute at the same time! Bravo! Oh I LOVE these!! Now I just need to learn how to make jam!! Thanks so much!! I linked to your post today! Thank you so much!! This made my label making so much easier. Fun, fun, fun!! I love these – thanks for sharing! Love these. I am making a bunch of grape jelly for a fund raiser and would love to use your label. Do you happen to have one for grape??? Thanks, everyone, for the linkage and kind words! For those of you asking about additional illustrations. I drew these myself and have been considering setting up a whole set for purchase on a stock image website like iStockphoto.com so you can get lots of additional images to use in your labeling. Will keep you posted on this! My question is, how do I put my name and date after I downloaded it? Thank you so much for the great design! These labels are just awesome! I wanted to ask whether you have a lable for pickles as well. Great labels – could you do one for marmalade and quince jelly? Thank you so much for sharing your great talent! Thank you for the canning love. I posted a link to your lovely site on my blog. Love your website and all the great ideas! Beautiful, simple and elegant! Where did you buy the brown paper used for the labels? Linda – The brown kraft paper that I used came in one of those rainbow colored multi-packs that you can get at Jo-Ann Fabric or Michaels. This kraft cardstock at Paper and More looks very similar to what I used. And Paper Source has a khaki colored cardstock that isn’t quite the same but would work well for this project. Hope this helps! I love these tags! I’d love the rectangular one for my pomegranate jelly. Wow these labels are fantastic!! They will make my jam jars look very classy…. I was just wondering if you could do an apricot Jam label? Please?? These labels are fantastic! Thanks for sharing them with us. I am so in LOVE with these labels. Any chance you would be willing to make apricot and apricot pineapple labels. I am about to undertake 50lbs of apricots. This are great! Thanks for sharing!! these are soo cute! is there anyway you could create a wild honey label for me? I am not computer savy at all!!! What delightful labels…thankyou for sharing your lovely ideas .I have just made a large batch of Raspberry jam and so now it’s on to the labels!Beautiful summer days here in the heartland of Ireland. Thank you, what a delight! I love-love-love it! I am making Elderberry jam this end of july and apple pie jam this fall, like I do every year. (My family demands it!) I stumbled on your website and fell in love with your sweet Ideas… I’m realy looking forward to trying out these cute labels on my jars…Thank you so much Kristen, It’s good to know the arts of our older generations still survive in ours! These are very cute labels, but DI make jelly, not jam. Help? What about a strawberry rhubarb jam label? I need one for that, thanks! Count me in as a major fan of these great labels! Thank you so much for sharing these. My only problem is that I want to print off the round ones to stick to the metal jar lids, but I can’t find large enough round labels. I live in Canada and I can’t actually find ANY round labels! Any idea where to get blank ones that are printable, and large enough for jars? Advice from anyone would be greatly appreciated. I can order from the US but I don’t think Paper Source has big enough ones. I need a prickly pear label. You know the cactus fruit. I love your labels, but I really need an elderberry tag! Did you make any for Jelly? I only make jelly . Or is there a way to change Jam to Jelly once you download? I love these labels. They are so great. I will be giving jam this Christmas for gifts and these labels were just what I was looking for. Thank you so much. I LOVE THESE LABELS! They are amazingly cute. Any chance you have a Hot Pepper Jelly or Cranberry Walnut Jam label? It would make an amazing Christmas gift. Can you make an apple butter tag?? These are beautiful, thanks so much for sharing, it should be fun jam season this year. Just wondering which program you used to create your labels? Also, where did you get your fruit pictures from? I am looking to create my own labels and need some tips! Thanks!! Shelley – I used Adobe Illustrator to create the labels. You can download a trial version here. I’ve also heard good things about Inkscape, which an Open Source vector illustration program. I drew my own fruit illustrations, but you might be able to find some cute ones on a stock image website. I love love love these labels, the only problem is there isn’t the flavor I need. I’m Looking for Saskatoon Berry, and Strawberry Rhubarb. I had my fiance attempt to edit the PDF you made but he was not successful. Do you have those tags? They are for our wedding favors and they would make such a great addition. Thank you so much. Now my jams will look so much prettier. Thank you for sharing these! I love how simply beautiful they are without being too busy! Just perfect! Lovely! This is just what I needed. I just started canning, and I am working Christmas gifts now. Also, happy to find a kindred spirit! Lovely blog. we have a vineyard and I make grape jeam and syrup-need a label with grapes please! Love the labels! do you happen to have one for grape jelly? I tried a different twist on the usual jam. I love the flavour and nutritional value of cranberries and decided to make jam from the dried variety. It turned out very delicious. I would love to have some of your lovely labels to put on the jars. Is there a possibility for a new creation of this sort? Thanks for the “Peach Jam” labels, they are beautiful. Merry Christmas and a Happy 2013! I retired 4 weeks ago and now have some time to do the things I loved to do before children, a job and all the business that goes along with life- like making summer jam! I was looking for labels and came across yours. They are wonderful. The best I have seen. Is there a possibility you could create a label for apricot jam? Thanks.